Bothmer Gymnastics and Games aim to assist the development of the students’ sense of movement, spatial awareness, balance, inner equilibrium and well-being through fine and gross motor skills. Bothmer gymnastics comprises a sequence of specially developed movement exercises, exploring and mastering increasing weight, leading to greater uprightness, social awareness and listening skills. 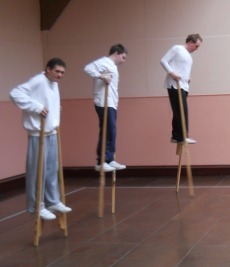 Students at all levels discover the joy of movement through activities such as rhythmical jumping exercises, rope skipping, catching and throwing, falling exercises, balancing on wobble boards, pedaloes and stilts, rod-fencing and acrobatics. In the summer term athletics including running, high and long jump, wrestling, discus and javelin throwing are also carried out. 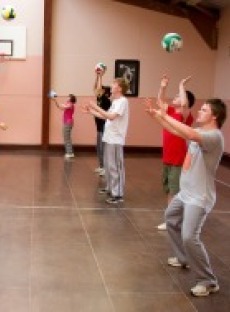 Skills in hockey, basket ball, volley ball and badminton are improved in weekly games sessions. College I students go swimming once a week in the local swimming pool. College II and College III students visit a local outward bound centre and participate in climbing high-rope courses, abseiling, kayak and archery, which enhances courage, physical confidence and social co-operation.